Measure Infra-Red Heat from Several Feet Away! 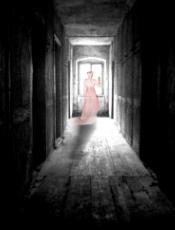 Infra-Red (IR) is a type of EMF we don't hear much about... but you know it when you feel it! This pistol-grip remote infrared thermometer (with laser pointer for pinpoint accuracy) will measure temperatures from 0º all the way up to 600ºF at a safe distance. Offers an amazing 2% accuracy and a resolution of 1ºF. Field of view is 6:1, emissivity fixed at 0.95. Backlit LCD readout is easy to see, even in dim lighting. Use the infrared thermometer to instantly measure the temperature of walkways, oven doors, motor housings, refrigeration coils, foods, countertops or anything that could be too hot or too cold to touch. 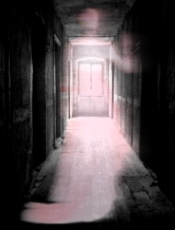 We have been told it works great for locating cool spots in paranormal studies as well! Complete with 9V battery. One year warrantee. The perfect thermometer for port-ability and ease of use. Readout in °C or F. Super light weight, versatile, and full featured. Low price too! Handy for kitchen, workshop, hobby, and paranormal research uses. Who wants to be alerted when a temperature change occurs? Temp-Pod automatically sets to the existing ambient nearby temperature baseline. When a temperature change occurs, Temp-Pod will emit a distinct tone for each degree change. A momentary Red (Hot) & Blue (Cold) LED will indicate trend of temperature change. If the temperature increases by 1 degree and remains steady for more than 10 seconds, the sound will automatically Mute until the temperature changes up or down by more than 0.1 degree. Great for working in low light conditions. Arrange several in a grid pattern to monitor a large areas. This essential tool can be used anywhere temperature and humidity are important to monitor. 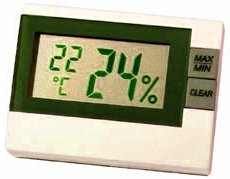 An easily readable LCD constantly displays the precise temperature and humidity. Max/Min function indicates the highest and lowest recorded levels of both. Very small, portable, and lightweight. Also ideal for ghost hunting, wine cellars, greenhouses, even humidors. Uses one LR44 button battery, included. Humidity Range: 10% to 99% R.H. 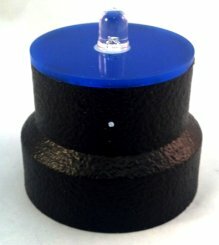 Size: 2-1/2" x 1/2" x 1-5/8"
What a perfect paranormal research tool. Very handy when mounted to a suitable staff (stick, pole, wand) for surveying temperature variations within a room. Put the meter body near the handle end and mount the remote sensor at the tip of the staff (up to 6 feet away!). 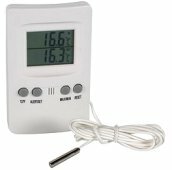 Simple-to-use and lightweight digital thermometer will measure the air temperature at 2 locations and displays both readings simultaneously. It’s one thing to find a warm or cold spot. It’s quite another to find a warm or cold spot that is different from the ambient surroundings! Meter has one internal sensor at the location of the display, and another remote sensor on a 6 foot cable. High resolution. Includes memory for min/max values, alert/set button to enter a preset value for local/remote temperature, temperature readout in °C or °F. Also great for checking indoor and outdoor temperature at home or office. Can be wall mounted or hand held. 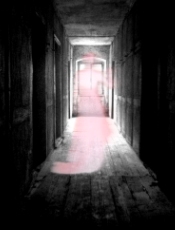 Copyright © 1996-2015, Less EMF Inc.
"The Deluxe Ghost Hunting Kit", "The Ultimate Ghost Hunting Kit" and "Ghost Hunting Party" are Trademarks of Less EMF, Inc.